Lucille Floyd Belda, 98, passed away in Norfolk on April 3, 2018. Born June 28, 1919 to parents Lawrence Robert and Evelyn Scott Floyd. She was predeceased by her beloved husband Francis A.Belda. A native of Capeville, she was a member of Trinity United Methodist Church .Mrs. 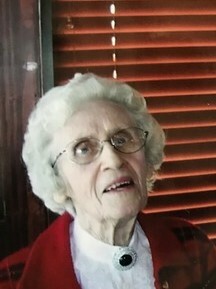 Belda worked for many years at A.C. Ward's Sr. Garage in Eastville with her husband, Francis,and later as a teachers aide in the Northampton County School System .Lucille lived life to the fullest through simple pleasures. She loved to read, watch Jeopardy and tend to her garden. Her life was never easy or extravagant , yet, she always found reasons to smile. She was grateful and kind and often thought of others before herself. Lucille enjoyed spending time with her neighbors and her church community. Until her final days she quoted biblical proverbs that offer advice and uplift. She lived her life based on these truths and for this will be remembered the most. Her devotion to family and her firm belief in God supported her in her final years and ultimately gave her peace. She is survived by a nephew, Gordon Lee Ward, Sr., great nephews A.C. Ward, III, Michael B. Ward, Richard A. (Tony) Ward, Gordon Lee Ward, Jr., Tom Tull and Jerry Holt, great nieces Lisa Hand, Gloria Harrison, Carol W. Gaskins and Lisa Tiedemann. She was predeceased by three sisters Fannie Smith, Eleanor Moore and Laurie Tull. Lucille was devoted to her sisters and they were inseparable as children. Eventually three of them lived under the same roof again at Sentara Village Assisted Living. A funeral service will be held on Friday, April 6th at 2:00 p.m. from the graveside at Capeville Masonic Cemetery with the Rev. Janet Allen officiating Online condolences may be sent to the family at foxandjamesfh.com Arrangements by Fox & James Funeral Home, Eastville.